Our radio broadcasts provide biblical wisdom to millions of people every week, helping to encourage and challenge new and old believers in their walk with Christ. Every day, 21,000 people visit our website, finding help and hope in the countless articles, books, online courses, radio programs and other practical and biblical resources to strengthen their marriage and family. More than 60,000 people attended a Weekend to Remember® in the past year alone where couples were able to build, grow and restore their marriage by improving communication and reigniting the spark they once had. Over 100,000 people have accepted Christ as their Savior at a FamilyLife event since this ministry was founded. We know that this kind of decision is foundational to any marriage or family issue. But we also know that there are still so many more families that need help. In a culture that is increasingly hostile towards Christian values, we must increase our efforts to provide practical and biblical help to people. Can we count on you to help us build and strengthen marriages and families? Your gift today to FamilyLife will provide practical, transferrable and transformational help in life’s most important relationships: God, spouse, and kids. 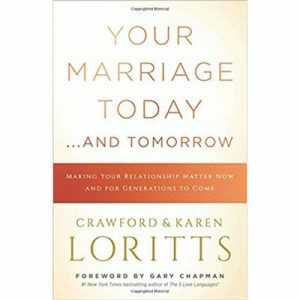 When you make your contribution today, you will receive a copy of “Your Marriage Today. . .And Tomorrow” by Crawford and Karen Loritts. We appreciate your ongoing support of FamilyLife! Please make your gift using the secure form below.